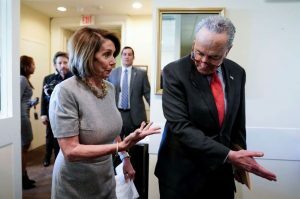 WASHINGTON, D.C. – House Speaker Nancy Pelosi, D-Calif., and Senate Minority Leader Chuck Schumer, D-N.Y., on Friday ripped President Trump over his declaration of a national emergency to finish building his proposed southern border wall. “The President is not above the law. The Congress cannot let the President shred the Constitution,” they said. Pelosi and Schumer vowed to use “every remedy available,” whether through Congress or the courts, to defend the legislative body’s power to control government spending. The pair called on Republican lawmakers to join their efforts. Trump on Friday cited crime and violence as reasons for declaring the emergency, which allows funds to be redirected from the Department of Defense toward impediments along the U.S.-Mexico border. During a Rose Garden address, he also anticipated a legal fight against his administration over the move. “I’ll sign the final papers as soon as I get into the Oval Office. We will have a national emergency. We will then be sued and they will sue us in the 9th Circuit, even though it shouldn’t be there. We will possibly get a bad ruling, we’ll get another bad ruling, and we’ll end up in the Supreme Court, and hopefully we’ll get a fair shake and we’ll win in the Supreme Court,” the president said. Trump’s declaration comes after Congress late Thursday passed a spending package that only provided $1.375 billion for 55 miles of physical border barriers, well short of his $5.7 billion demand.